A wide variety of habitats. Wet to moderate moisture. Shade tolerant. 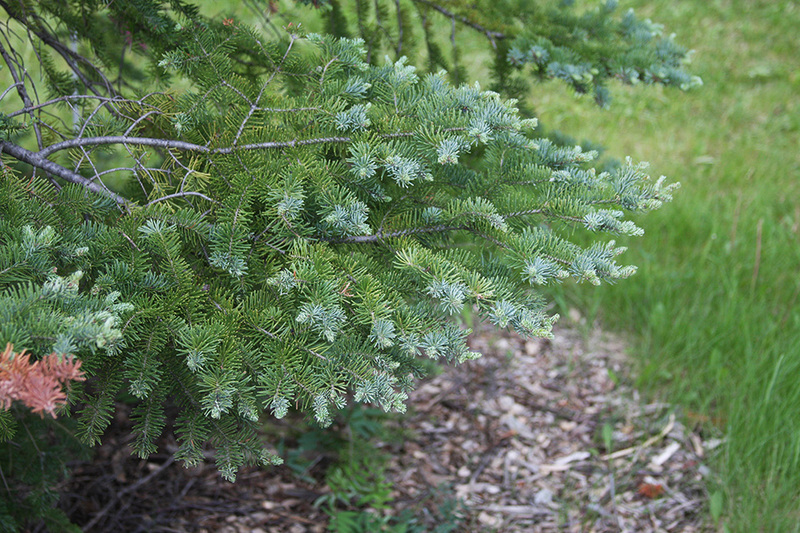 This is a slow-growing, intermediate-lived, small to medium sized, coniferous tree. It rises on a single trunk from shallow root system. 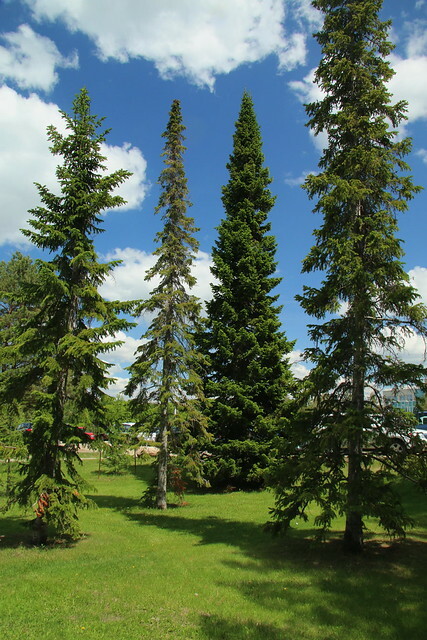 In Minnesota mature trees are usually 40′ to 60′ tall and 12″ to 18″ in diameter at breast height, though individuals can reach over 80′ in height. Most trees are harvested for pulp before reaching 55 years in age. Those that are not harvested may live 150 years, the oldest individuals up to 200 years. The trunk is straight, regularly branched, and distinct to the top of the crown. The crown is slender, symmetrical, pyramid-shaped, and regular, and has a spire-like top. In open areas the crown extends to the ground. In densely wooded areas the lower branches die but remain attached to the trunk for several years. 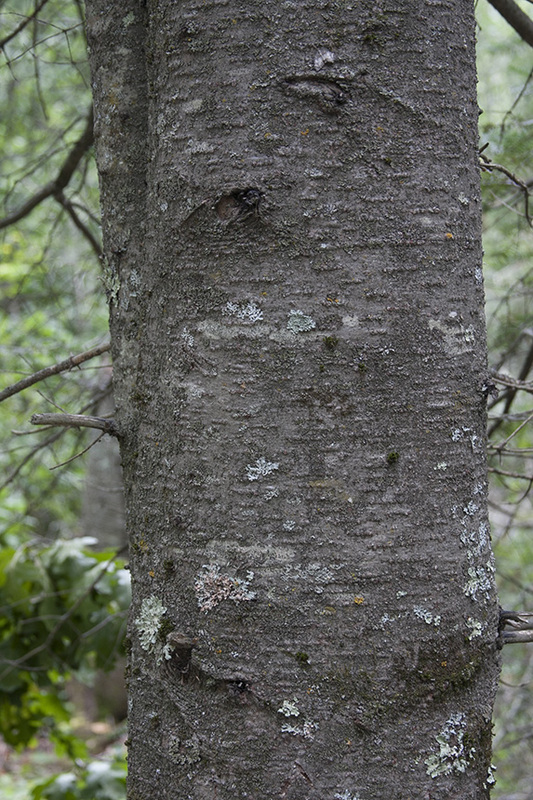 On young trees the bark is thin, smooth, light gray, and shiny, with many raised, resin-filled blisters (pitch pockets) that burst when scraped with a fingernail. On mature trees the bark becomes reddish-brown and breaks into irregular scales. The branches spread at right angles from the trunk. Lower branches droop somewhat. The twigs are mostly opposite, stout, pale brown to greenish-brown, and smooth. They are sparsely covered with short, stiff hairs. The leaf scars are circular and flat. Twigs are smooth to the touch after the leaves are shed. The buds are ⅛″ to ¼″ long, broadly egg-shaped, blunt-tipped, and sticky with resin. They are covered with broadly triangular, sharply-pointed, yellowish-brown scales. They are closely grouped at the end of the twig, with no needles between the terminal bud and the closest subterminal bud. The needle-like leaves are ½″ to 1″ long, 1 ⁄32″ to 1 ⁄16″ wide, linear, flat, two-sided in cross section, and straight or slightly curved upward. They are evergreen, lasting 8 to 13 years. They are blunt or slightly notched at the tip, except near the top of the tree, where they are sharply-pointed. The upper surface is dark green, shiny, and shallowly grooved. It is sometimes slightly covered with a whitish, waxy bloom (glaucous). The underside is silvery-white with a prominent green midrib and margin. There are 4 to 8, usually 6 or 7, rows of white dots on each side of the midrib. Each dot (stomate) is a pore, surrounded by two white guard cells, that allows the exchange of gasses. 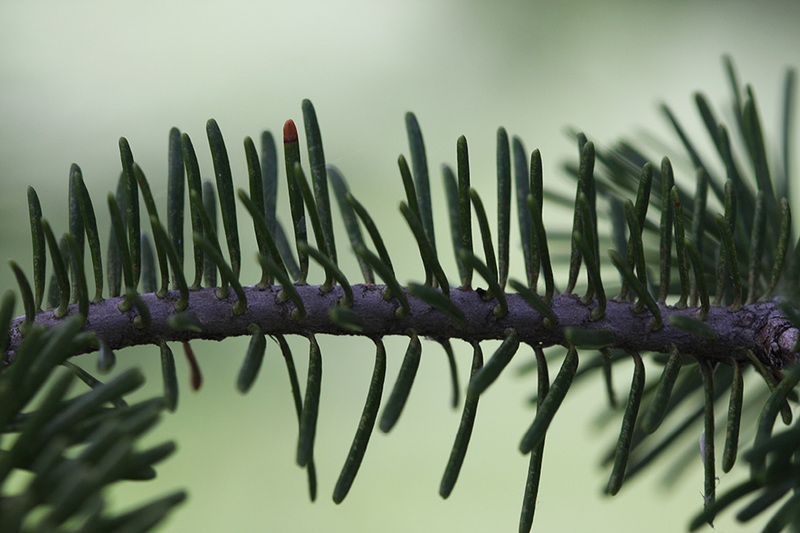 The needles are borne singly and are attached directly to the twig. They are arranged spirally around the twig, but often appear two-ranked where they twist toward the upper side of the twig. This is especially noticeable near the bottom of the tree. The needles are fragrant when crushed. Male and female cones are borne on the same tree. 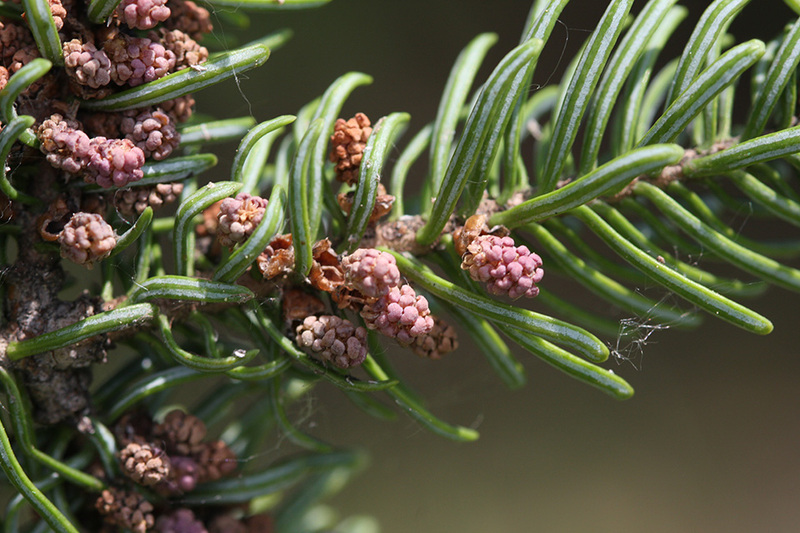 Pollen (male) cones appear in dense clusters in leaf axils on the underside of second-year twigs in the middle of the crown, usually within 15′ of the top. At pollination they are red, purplish, bluish, greenish, or orange; egg-shaped to oblong; and ¼″ to ⅜″ long. Female cones appear singly or in small groups on the upper side of second-year twigs in the upper 5′ of the crown. They are erect, barrel-shaped, 1½″ to 3″ long, and ⅝″ to 1¼″ wide. They are green tinged with purple at first, becoming grayish brown at maturity. The scales are thin, flexible, and fan-shaped, wider than long, especially near the center of the cone. Pollination occurs mid-May to early June. Female cones mature in the autumn of the first year. They begin breaking apart and shedding seeds in early September. The scales drop off leaving the central core, which may remain on the tree several years. The seeds are brown, ⅛″ to ¼″ long, 1 ⁄16″ to ⅛″ wide, and resinous. They have a thin, papery, brownish-purple, ⅛″ to ¼″ long wing. 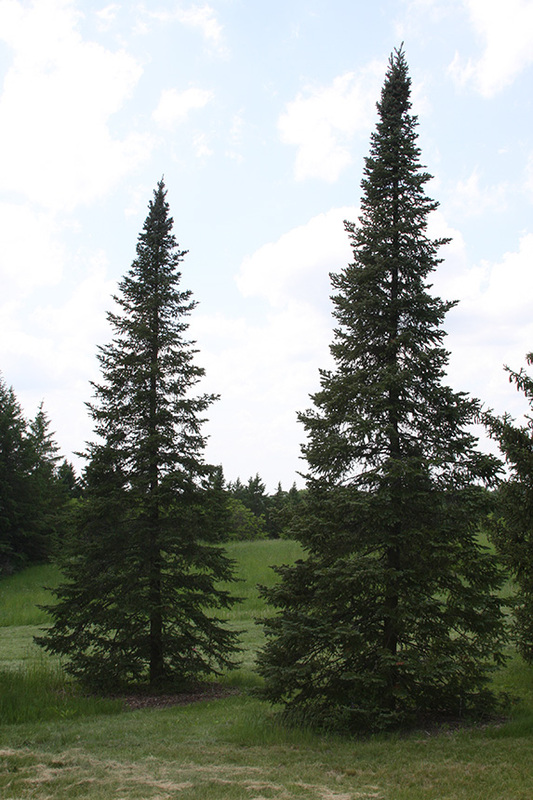 The champion balsam fir in Minnesota is on state property in or near Tamarack, in Aitkin County. In 2015 it was measured at 85′ tall and 72″ in circumference (23″ in diameter). 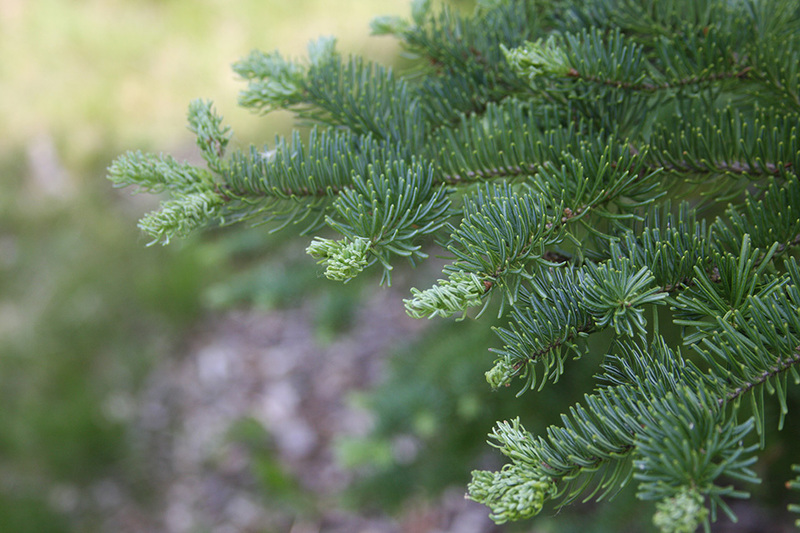 Canada yew (Taxus canadensis) is a shrub, not a tree. There is no central trunk. Twigs and buds are green. The needles taper to a long point at the tip and taper to a distinct stalk at the base. There are no rows of white dots on the underside of the needles. 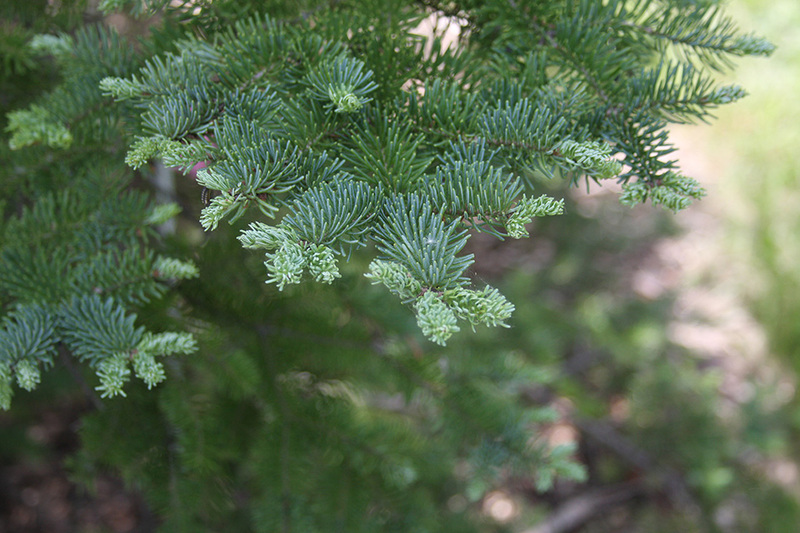 Female cones are tiny and inconspicuous when young. They mature into a bright red, fleshy, berry-like structure (aril) that partially envelopes a single seed. 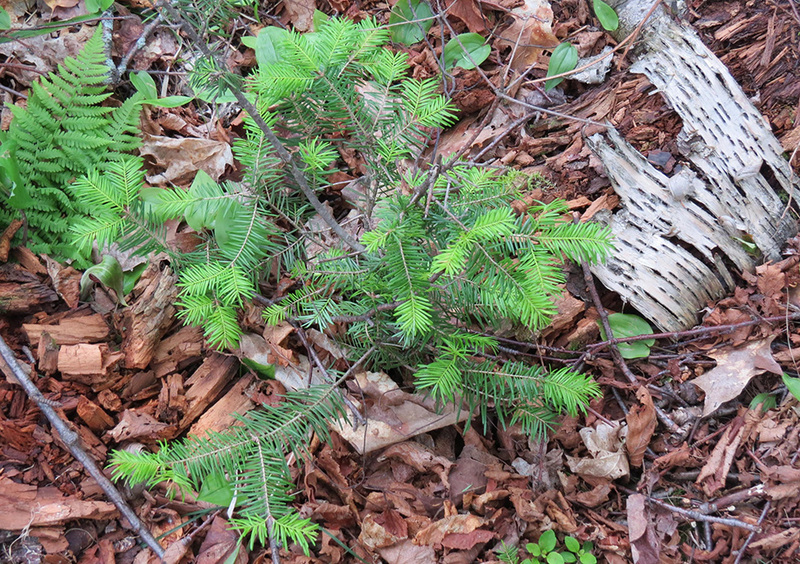 Eastern hemlock (Tsuga canadensis) bark on young trees is rough and scaly, not smooth. The needles are sharply pointed and shorter, ¼″ to ½″ long. They are attached to the twig by a thin stem emerging from a small, woody projection (leaf peg) that remains on the twig after the leaf falls, making the twig rough to the touch. Mature seed cones hang downward and are much smaller, no more than 1″ long. 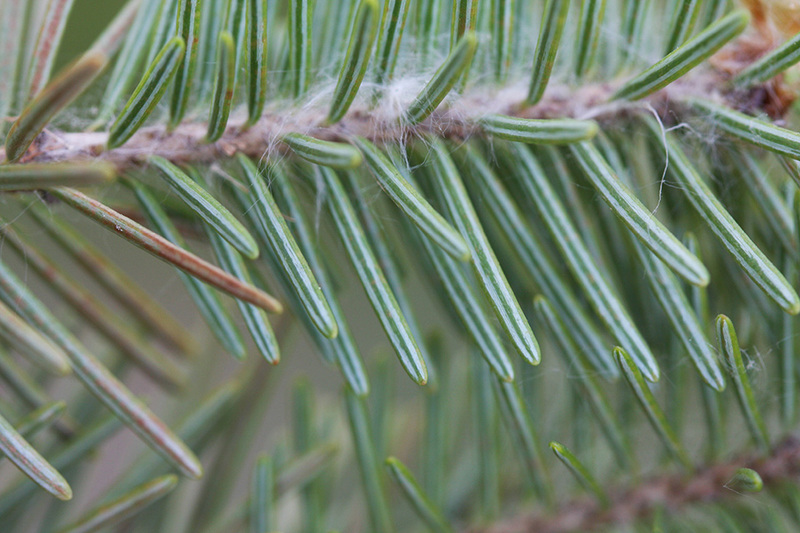 Pine (Pinus) needles are borne in bundles (fascicles) in groups in 2, 3, or 5. Cone scales are thick, woody, and rigid. 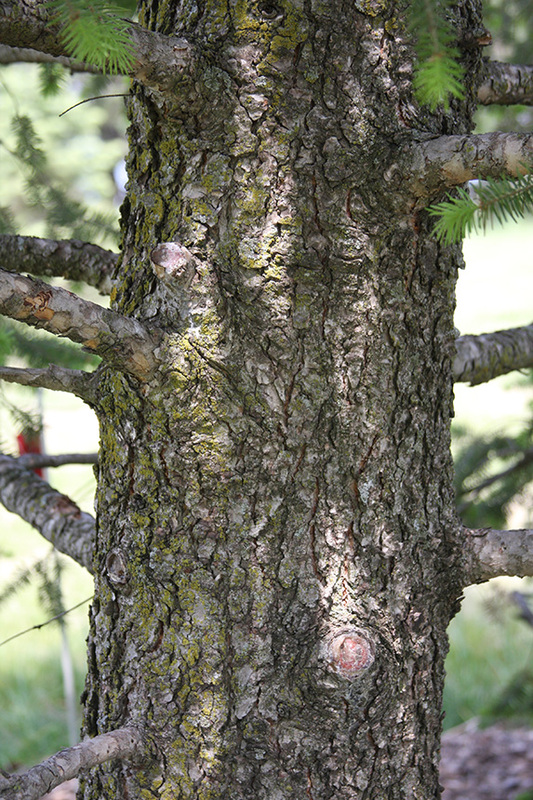 Spruce (Picae) bark on young trees is rough and scaly, not smooth. 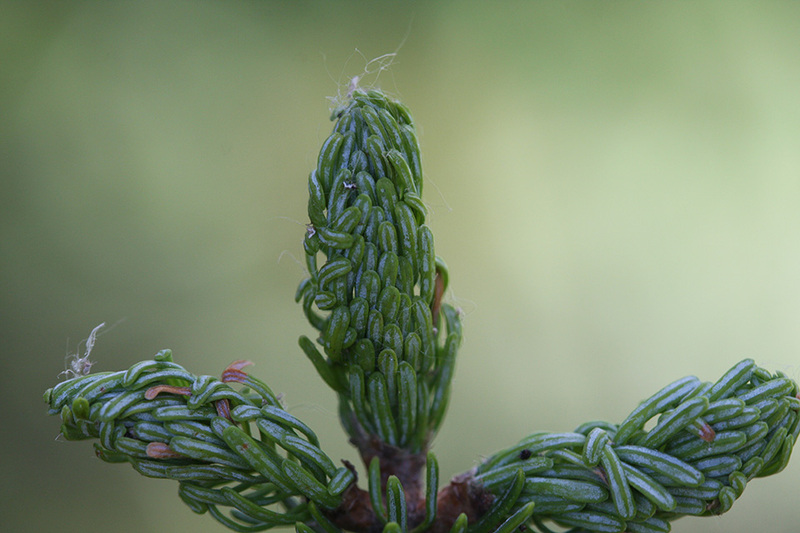 The terminal bud is separated from the subterminal buds by a few needles. The needles are firmer, sharply pointed, and rectangular in cross section, not two-sided. They are attached to to the twig by a small, woody projection (leaf peg) that remains on the twig after the leaf falls, making the twig rough to the touch. Mature seed cones hang downward and remain intact even after falling from the tree. Pull a needle off a twig and roll it between thumb and forefinger. If it rolls smoothly, it is rectangular and the tree is a spruce. 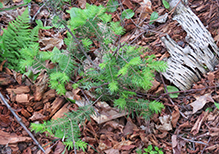 If it will not roll, it is flat and the tree is a fir, hemlock, or yew. 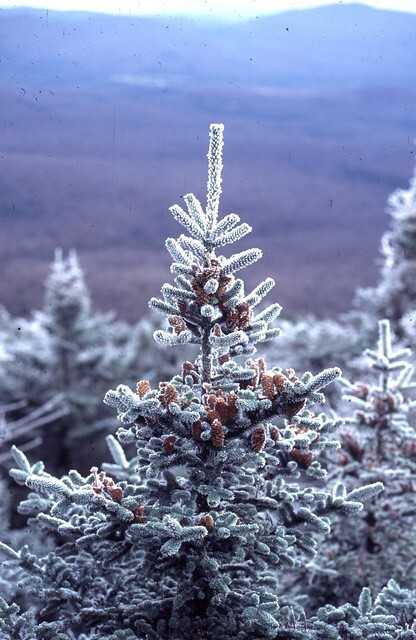 There are eleven species of fir in North America. This is the only one that occurs in Minnesota. This is the provincial tree of New Brunswick. 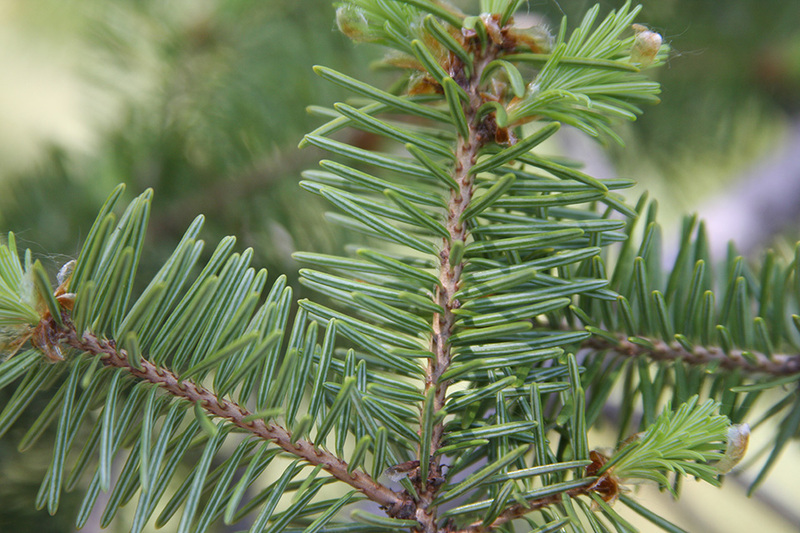 IDENTIFYING THE BALSAM FIR AKA CHRISTMAS TREE FROM THE SPRUCE TREE! 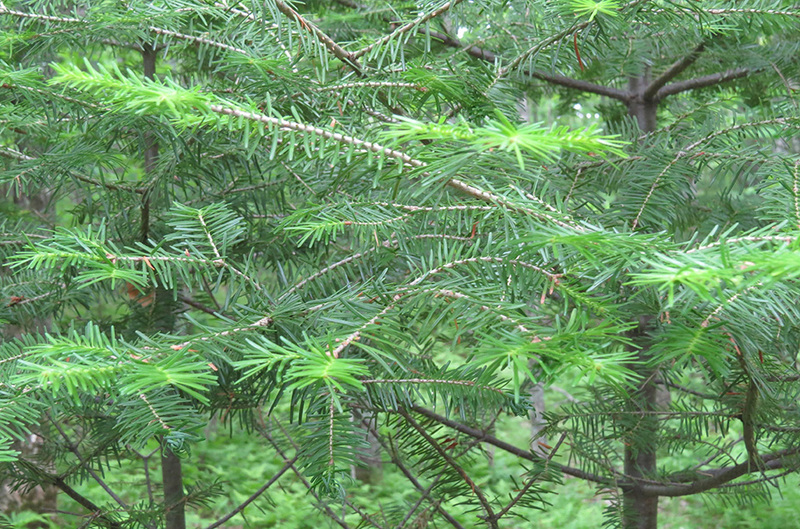 University of Maine Cooperative Extension talks about how to properly identify and harvest Maine Balsam Fir tips. 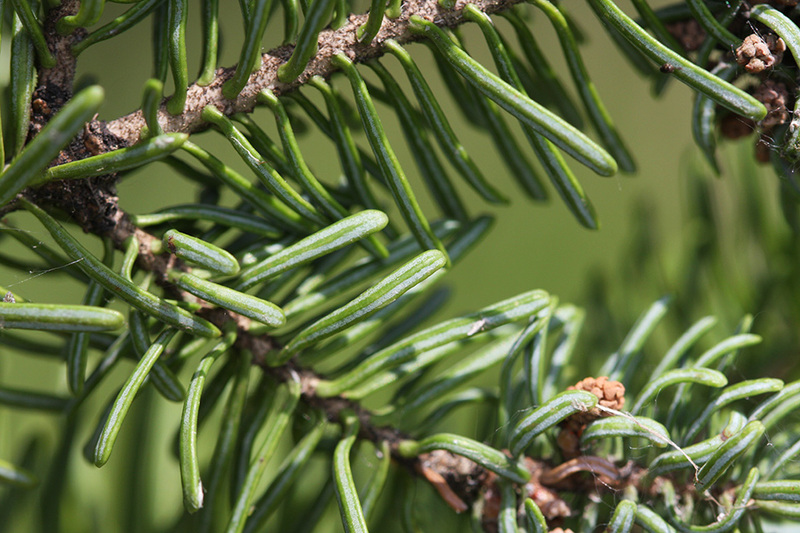 How to tell the difference between Balsam Fir and Hemlock. A few other trees too and Balsam Fir sap.